Wow I found this article on Yahoo.com, if this does not inspire a student to keep going for their dreams I do not know what will. It’s never too late to go back to college and get your college degree. I know you hear that a lot sometimes, but when you hear this story, you might just think I am right. Hazel Soares is 94 years old and she was able to achieve what most of us do not or feel like we can not accomplish at our age. Hazel Soares was one of 500 students to get their dipoma Saturday at Mills College. Hazel Soares has six children and 40 grandchildren and great grandchildren. WOW I know, that is a lot of family, and with that she is the second oldest person in the world to graduate from college. 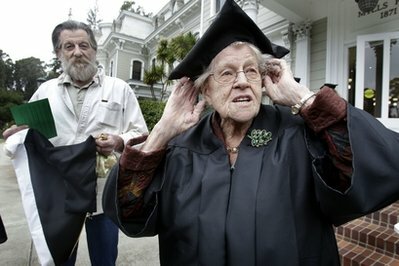 Nola Ochs of Kansas was the oldest to graduate three years ago at the age of 95 and now topped that with a master’s degree in liberal studies from Fort Hays. Hazel Soares said she always wanted to go to college but when she was younger the Great Depression was happening and only people who can afford college went. She never gave up on her dream though, and with all in all has managed to do just that. Dream and make it come true. Hazel Soares plans on working for the San Francisco museum after this. I say good for you Soares, GO FOR IT! This women amazes me in every sense of the word. Sometimes I sit and I complain that College is not for me, how hard it is, and how much sacrifice I have to make to continue working on my education. Why didn’t I finish when I was younger etc etc. You can not change time and you can not change the life you are in. If you want something go for it! Nothing in this world can stop you, if you do not let it. Hazel Soares is an inspiration to many, and I think she will continue to be an inspiration to the students that graduated with her. This just proves to so many of us that when you really put your mind to something, when you really dream about something you want, ANYTHING IS POSSIBLE! Whenever you feel like you can not do something, whenever you feel helpless or too old, think about this story and ask yourself, Is it really impossible? I think NOT! « I want to leave home, what do I do?